Something for the vacation months . . . The Supreme Court poem was written by Andrew Motion, Poet Laureate between 1999 – 2009, to mark the creation of the Supreme Court. 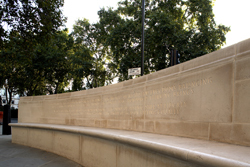 The poem is enscribed on the semi-circular stone benches opposite the main entrance. Leave a reply on "Lines for The Supreme Court"